I just found out about Conceptboard, a cool visual collaboration tool, from the company itself. Conceptboard is a cloud-based service that works on PCs, laptops, tablets, and more. 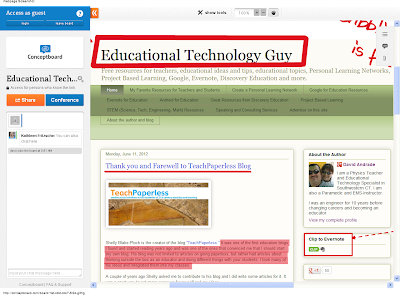 It is basically on online whiteboard that allows you to create, review and discuss ideas and concepts and you can even upload a document (PDF, PPT, Doc, images) and share, comment, and work on also. You can also just draw and write on it. It features real-time, and asynchronous collaboration. You can work with other people in real-time, or people can access the work space at different times and comment and work on the project. There is a moderation mode that allows you to use it as a screen cast and presentation tool and there is also a video conferencing tool. Here is an example of one with a screen shot of my blog with annotations and highlights on it.